THE pilot of the Nigerian Air Force helicopter that crashed in combat against Boko Haram on Wednesday was only 25 days into his marriage when he lost his life defending Nigeria’s territorial integrity. The Bayelsa born Flight Lieutenant Perowei Jacob died alongside Flight Lieutenant Kaltho Paul Kilyofas ,the Co-Pilot; Sergeant Auwal Ibrahim, Flight Technician; Lance Corporal Adamu Nura, Gunner; and Aircraftman Meshack Ishmael, Gunner, when their Mi-35M helicopter crashed while providing close air support to troops of 145 Battalion, Damasak in Borno State. Jacob got married only on December 8, 2018. Nigerians have taken to the social media to pay tribute to him and other victims for their gallantry and patriotism. 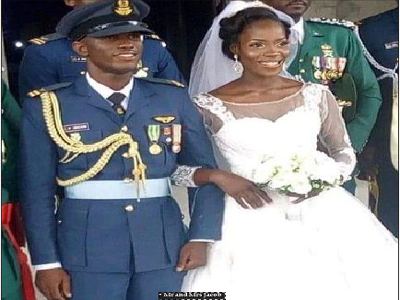 Deronke Eunice Abebi writing on her Facebook wall said of him: “Flight Lieutenant Pereowei Jacob got married on the 8th of December, 2018, he died on the 2nd of January 2019, while providing cover in fighter Jet for troops battling Boko Haram terrorists. “Making his young beautiful wife a widow after three weeks and two days of marital bliss. In a condolence message on Thursday, President Muhammadu Buhari said the sacrifice of the fighters will never be in vain. “These fine officers and men lost their lives striving to guarantee our safety and protection as a people and a nation,” the President said.